1 of 3 Bring a large pot of lightly salted water to a boil. Add broccoli rabe and cook 3 minutes. Scoop into bowl with a slotted spoon and add pasta to boiling water. Cook 9 minutes. 2 of 3 Meanwhile, drain water from broccoli rabe. Heat 2 tablespoons olive oil in a large skillet over medium heat. Add garlic and cook 2 minutes. Stir in broccoli rabe; cook 3 minutes more. Season with 1/8 teaspoon salt and 1/4 teaspoon pepper. 3 of 3 Drain pasta. 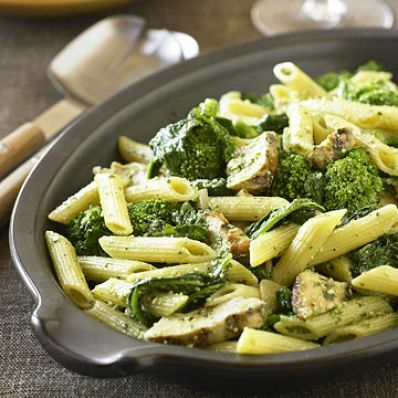 Stir chicken, pasta and pesto into skillet. Cook 2 minutes to heat through. Serve warm.